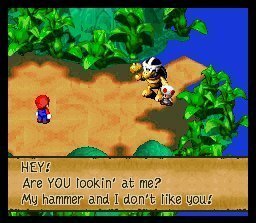 This is the first of a seven-part series combining Mario RPG and 24. These were done during Season Six of the show, so most of the 24 references generally relate to that season. In a way, this blog isn't truly new. I've been writing pretty extensively since about 2001 for a small audience. For the most part, I write about gaming, but I often take forays into politics or whatever else gets me going. This site, at least at first, will mainly feature my gaming writings. Specifically, image-blogs, featuring screenshots from a particular game with my running commentary. I've done literally hundreds upon hundreds of these, so I have no shortage of things to post on here. Why did I start this? I figured it was time to start expanding... or at least create the opportunity for more people to read my work. I use the term "my work" loosely, because many of the things I write are pretty off-the-wall. My writings run the gamut from serious to completely not, and usually fall somewhere in the middle. I make a lot of cultural references...a whole lot. References to 24, South Park, musicians I don't like, wrestlers, and The Bush Administration abound. Some people will like my writings, some won't. That's the way it is. I'm putting them out here for the people who do. Seriousness is simply the uncommon end of the spectrum of my writing. Reviews and so forth will pop up on here from time to time, and these will be my more austere postings. Whenever I finish a game that has some sort of major impact on me or cultural relevancy, chances are I'll put together one of these all-business reviews. For the most part, however, my image-blogs are done in an unserious manner, and are meant to only be humorous looks at the games (or movies, or shows, or...) in question. For those who don't know me, my real name is Jericho, or Jer for short. I've been playing games since I was a kid. I've grown up with their evolution, as well as seen the best and the worst of them. Games, however, are only one cog in the machine here. One final note...some of my writings are definitely on the Rated R side. Mature jokes abound. Exercise caution, and don't let your six-year-old in here.